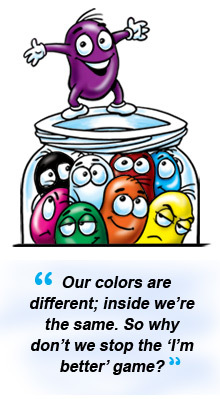 “Nine little jellybeans playing in a jar…” But these jellybeans don’t just play; they have some very important things to say. Through colorful, engaging illustrations and clever, insightful dialogue, author Willie Wood provides readers with a jellybean-jumping-off-point for thoughtful discussion. Which jellybean is the best? Why can’t the jellybeans get along? How do they resolve their differences? Nine Little Jellybeans captures emotions children may not yet know how to verbalize. It is an excellent tool for initiating anti-bullying and anti-discrimination lessons for children of all ages. Copyright © 2019 by Willy Nilly Productions. All rights reserved.